With the Yampa River running right through downtown Steamboat Springs canoeing, kayaking, and paddle boarding is engrained in this town’s DNA. With many of the shops located either on or within walking distance of the Yampa River, it&apos;s possible to grab your water toy and be on the river in minutes. In addition, several outfitters offer rental tubes as well, so relax on Steamboat&apos;s natural amusement park ride and then catch a shuttle back to your car. The Yampa River runs right through downtown Steamboat, providing a class II river experience for all thrill seekers. 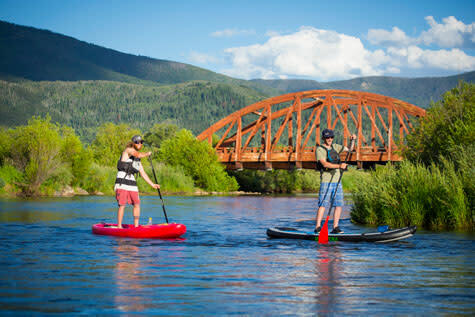 The standup paddleboard craze gets its own unique Steamboat twist here in the Rocky Mountains, where the wild and free flowing Yampa River makes for exciting whitewater paddleboarding, while quiet ponds are the perfect place to learn new techniques or try out SUP yoga. If vast, scenic lakes are your paddling style, paddleboard on Stagecoach Reservoir or Steamboat Lake and take in the views while basking in the warm sun and refreshing breezes.